It look like something Doc Brown would be working on in his garage, but it is absolutely one of the most essential and sensitive technologies found on many military and some civilian aircraft today: The Ring Laser Gyroscope. Introduced in the mid 1960s and developed rapidly from then on, the Ring Laser Gyroscope has taken the place of many larger and more complex mechanical gyroscope systems. In comparison to their predecessors, Ring Laser Gyros can be built much smaller, they do not resist changes in direction, are totally frictionless, have low power consumption, and feature almost no moving parts, thus they are incredibly reliable, while still providing adequate accuracy. 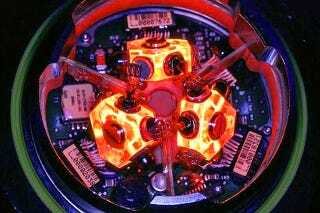 Ring Laser Gyroscope's small size has also made them particularly well suited for tactical aircraft, both manned and unmanned, and weapon systems that once had to rely on much bulkier inertial navigation systems made up of accelerometer and mechanical gyroscopes. These include bombers, surface combatants, satellites and submarines. Additionally, this technology has migrated to the commercial marketplace, and many modern airliners and ships also feature RLG technology in their navigational suites. An idea of how a Ring Laser Gyroscope works can be seen in the almost comically bad Russian video below or in this explainer. Today, modern inertial navigational suites found on some aircraft, submarines, ships and spacecraft use Ring Laser Gyroscopes as part of an integrated Inertial Navigation Systems (INS), and in some cases, fly-by-wire flight control systems and targeting pods use them as well. Inertial navigation systems with integrated GPS can pair gyroscopes, and in many cases Ring Laser Gyroscopes, and accelerometers with a GPS receiver system. Software within the system cross-checks the readings of each discreet navigational sensor source, and possibly other sources such as radio navigational beacons, flight data such as airspeed and attitude, and doppler and radar altimeter data to come up with an 'agreed upon' position. Generally speaking, if one of the sensors of data sources used by the INS begins to deviate from the majority of the sources, or from a more heavily weighted source as computed in the software's 'voting' algorithms, then less weight will be given to the deviating source. If a source is way off position in comparison to others, or showing signs of failure, it could be filtered out by the INS software entirely. This leaves a less precise positioning capability, but not one that is entirely compromised due to a single failed or spoofed discreet sensor within the system. Sometimes multiple Ring Laser Gyroscopes will be used in a single Inertial Navigation System to work in tandem for redundancy reasons or for automatic cross-checking. Developed by inventive genius Elmer Sperry, the device was first demonstrated by Sperry's son Lawrence during France's Airplane Safety Contest in June 1914. During the demonstration flight over the Seine River, Lawrence let go of the controls, stood up in the cockpit and raised his hands high above his head. Then came a roar of approval from the crowd gathered below as his mechanic walked far out onto the wing and the plane remained level. As the Sperrys' flight demonstrated, a gyroscopic autopilot could fly an aircraft straight and level on a compass course without a pilot's constant attention. As a result, pilots could fly further without becoming fatigued, improving safety and setting the stage for the longer-distance flights that would would become popular with the rise of commercial aviation in the decades to come. Today, this technology has moved beyond just autopilots, as Ring Laser Gyros can also be used for stabilizing an aircraft in space when its data is tied to an aircraft's fly-by-wire flight control system. For instance, the 'carefree handling' capabilities found on modern fighter aircraft allows aircrews to literally point the jet where they want it to go with minimal coordinated control or thought given to the aircraft's gross weight and configuration. The F-35B's hovering capability is possibly one of the most exotic examples of this. Unlike the Harrier, where a pilot has to baby the aircraft in hover mode as if it were teetering on top of a telephone pole, the F-35B has a highly simplified fly-by-wire control system, one that even allows a pilot to take their hands off the controls, resulting in the aircraft steadily holding its position in midair. Ring Laser Gyros' lack of moving parts and small size, such as the Honeywell HG1900 IMU which weighs under two pounds, and the HG1700 IMU which weighs under a pound, make them ideal for integration on guided munitions. The Joint Direct Attack Munition (JDAM), Paveway IV dual mode laser guided bomb, use these units, along with GPS, to execute incredibly pinpoint attacks on their targets. Also, the inclusion of a competent INS system along with GPS means that if a GPS signal is jammed or lost, the munition still has a high-probability of effecting its intended target. Virtually all advanced smart munitions have a integrated INS systems featuring Ring Laser Gyros, from Tomahawks and advanced air-to-air missiles, to guided artillery shells. Yes, artillery shells. These howitzer rounds present their own unique problems to something as miniaturized and sensitive as Ring Laser Gyroscope. A 155mm artillary shell will experience well over 10,000 times the force of gravity as it is fired, and seeing as payload (ie explosives) needs to be maximized on these rounds, stuffing a hardened guidance system into a 100lb artillery shell is challenge to say the least. Micro Electro-Mechanical Systems (MEMS) technology has allowed such a feat to become a reality, and Honeywell's HG1930 Gun Hard IMU can withstand up to 20,000 times the force of gravity and still be ready to guided the round on its way to its intended target. This is truly amazing technology that is being tested today on the Army's M982 Excalibur 155mm guided round. The Navy is taking the guided artillery round one step further with its 155mm Long Range Land Attack Projectile (LRLAP). This will be the primary precision weapon for the DDG-1000 Zumwalt Class' advanced deck gun system. This rocket assisted artillery round will fly out to over 75 miles to impact its target within about 100 feet or less. Like the Excalibur artillery round, the Navy's LRLAP will use a GPS embedded INS, including a hardened and miniaturized Ring Laser Gyroscope, to navigate its way to its final destination. As Ring Laser Gyroscopes and integrates INS technology continues to shrink, smaller and smaller unmanned aircraft, and the micro-munitions they carry, will be capable of incredibly precise navigation, even in areas where GPS is denied. GPS not being a guaranteed resource during a time of war is a real possibility in potential future peer-state conflicts, where space could be a battleground in itself. Advanced jamming and GPS spoofing technologies that are already being fielded today also pose a major threat to GPS dependent systems. This means that in a battle against a capable foe, the non-GPS dependent components in modern Inertial Navigation Systems, Ring Laser Gyros included, may be relied upon more than ever before in mankind's post-GPS navigational history. Pictures of RLG via Honeywell, other pictures via public domain.